With the development of new parenteral products and specialized therapies for small patient populations and the increasing trend for user-friendly and safer self-administration systems, pre-filled syringes and, more generally, ready-to-use (RTU) components, are becoming the preferred solution among the different parenteral dosage forms. Current market trends in aseptic fill-finish are now forcing pharmaceutical companies to adopt agile manufacturing strategies and embrace new technologies to meet the actual requirements for a highly variable production process. Central goal is to achieve flexible production in a safe, aseptic environment, implementing cost-saving solutions with a space-efficient design. The pharmaceutical industry has been increasingly embracing injectables as a consistently profitable business sector. For decades, injection has been largely limited to in-patient use, with health professionals actively involved in administering doses intravenously, intramuscularly and subcutaneously. The introduction of prefilled syringes and injection devices has reduced the fear factor associated with outpatient injections. In aseptic processing, operators are the primary source of contamination. Although human operators figure in a potentially risky activity in sterile areas, pharma manufacturing remains predominantly human. 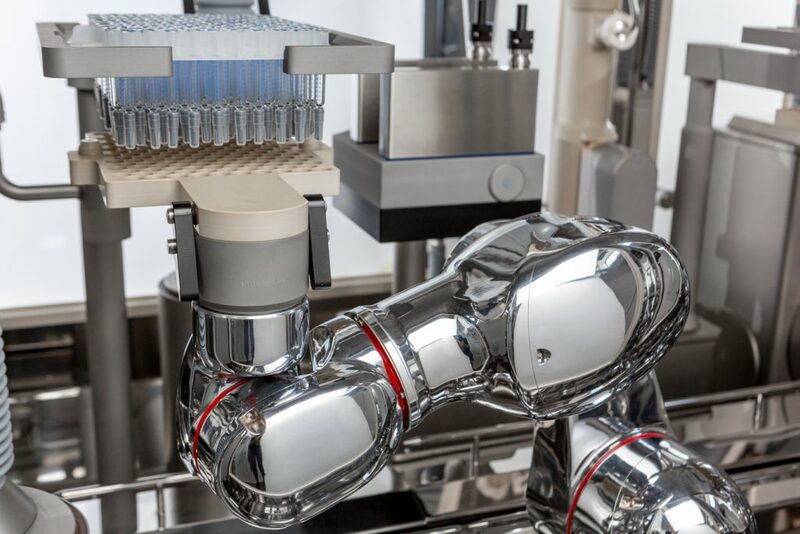 Therefore, one of the focal topics for pharmaceutical manufacturing today is how to improve the use of robotic automation in a gloveless, isolated environment. The ideal outcome is the creation of a digitally controlled aseptic process with little to no human intervention. To address this issue, in many pharmaceutical industries, conventional filling systems are now progressively implemented with robots. However, these robots are typically used for only one step of production, i.e. for simple moving of vials from station-to-station or for removing the cover from a tub of nested containers. However, these attempts generally represent only half-steps towards utilizing the full potential of robots. To achieve the aim of reaching the maximum possible improvement in safety and productivity the full fill/finish process should be completely based on robotics operating in a closed, gloveless, isolator environment. INJECTA can meet these fundamentals, tracing the roadmap for a real and complete fill-finish process modernization. 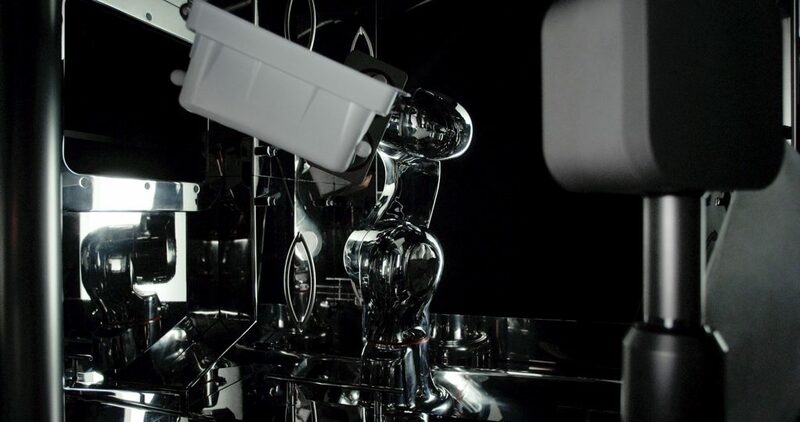 Its fully isolated robotic filling system is designed as a whole, an integrated system utilizing all robotic capabilities. Kawasaki’s seven-axis robot arms are made in st. st. and designed for the lowest particle shedding. They are resistant to positive/negative and high pressures and fully compatible for decontamination using H2O2 vapors. INJECTA’s specialized robots not only provide precise, consistent handling activities, but also offer a high level of flexibility: they are completely digitally controlled with Industry 4.0 capability. No human interventions are required: all activities/issues are solved through robot interactions. If flexibility is crucial for high-value and medium-low production batches, INJECTA is naturally born to be flexible. Its filling system can accommodate a wider range of containers (tub, nest and trays) and components (vials, syringes and cartridges) with minimal or no size changeover. Further to this, its flexible methods of production allow both the bulk processing of vials and the processing of Ready-To-Fill components. It can easily combine robotized in-nest or de-nesting operations before filling or after stoppering. INJECTA inbuilt “combi” configuration guarantees a whole, contained integrated production system with no use of interchangeable production modules to adjust production processes. Injecta is flexible and precise in terms of quality. It works with multiple primary packaging components. Its design is intrinsically modular and meets multiple requirements from small-scale clinical trial batches up to medium high production levels. INJECTA supports a completely automated fill/finish process without the need for gloves and glove ports, guaranteeing a greater level of sterility. Single-use materials such as ready-to-use primary containers, disposable inner/outer bags, etc. are used and disposed of within the system. Its advanced design allows faster setup and efficient product changeover, involving therefore a faster VHP cycle developmentwith respect to conventional isolated lines. Results are a reduced filling line downtime, expanding capacity and increasing flexibility. We can finally state that the robotic technology is a real new challenge in terms of greater accuracy, innate modularity, flexibility, and reliability. The risk for microbial contamination generated by operating personnel is virtually eradicated by its advanced aseptic production system. Gloveless solutions drastically remove the potential for human contamination and guarantee a greater level of sterility. INJECTA’s gloveless isolated robotic filling system intrinsically entails all these benefits. It represents our approach to INDUSTRY 4.0 requirements and reinforces our vision: to create value for customers by means of advanced technology, process improvement and service support. The pharmaceutical industry has been increasingly embracing injectables as a consistently profitable business sector. For decades, injection has been largely limited to in-patient use, with health professionals actively involved in administering doses intravenously, intramuscularly and subcutaneously. The introduction of prefilled syringes and injection devices has reduced the fear factor associated with outpatient injections. In short, injection has evolved from a being a last choice dosing option for patients. These syringe and cartridge based packages also reduce the possibility of errors in preparing and administering a subcutaneous injection. However, it may not be surprising to find that all of the top 10 pharmaceuticals by sales in 2018 were injectable, most of which are biologics and biosimilar: the future expansion of injectables is directly linked to the future of biologics. The industry shift to biologics has established a growing market for injectables and supporting technologies. The pharmaceutical industry is adopting more and more emerging technologies to improve product quality and manufacturing efficiency. Considering the steady growth of these next-generation therapies, Pharma companies’ main concern focuses on product quality rather than production performance. 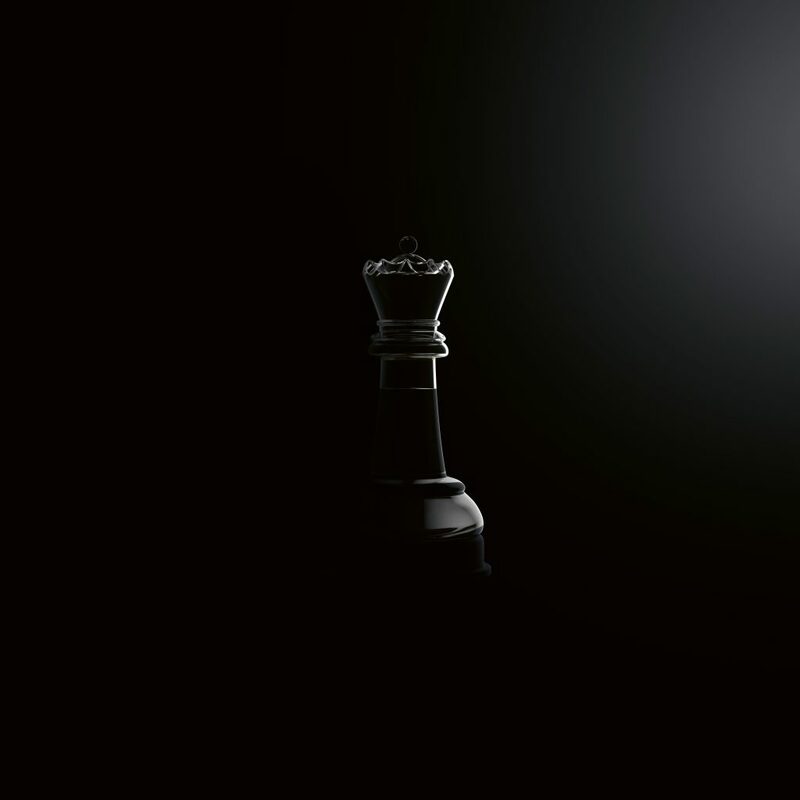 We can therefore claim that flexibility in manufacturing is fundamental to production success. Flexible facilities allow production of different product volumes that can quickly respond to changes in expected market demand and enable rapid switching between different products and product packaging (i.e. vials, cartridges or syringes for parenteral). Pharmaceutical companies that move products to market faster will beat their competitors in an era that demands greater agility. Within this scenario, we have come up with INJECTA, a new concept of aseptic filling machine for injectable pharmaceuticals. Our aim was to adopt an innovative approach to handling nested syringes, vials and pre-capped cartridges. We were motivated by the notion that conventional, fill-finish lines are not flexible in terms of primary packaging materials (such as vials, syringes and cartridges) as expected by the latest market requirements. They fail to meet the current need to produce a varied product portfolio. When therapies require smaller volumes and there is a higher number of different products to manufacture in medium to low production batches, flexible methods of production are essential. INJECTA responds to this demand for high flexibility and to the challenges of the ever-increasing complexity of new drug substances. The use of advanced robotic driven manipulations versus conventional handling systems actually improves product quality and manufacturing efficiency. INJECTA can handle pre-sterilised Ready-To-Use containers (syringes, vials or pre-capped cartridges), pre-oriented vials in trays as well as sterilised vials from depyrogenation tunnel, permitting high process flexibility and adaptability. Specialised robots perform all handling activities with no glass-to-glass contact and in the absence of operator intervention. The result is “less time” spent validating aseptic conditions, and superior agility for multi-product manufacturing. A very high level of modularity means INJECTA can be set for 1 or 2 filling groups for clinical trials of small production badges and for 5 or 10 filling groups for high production demand. It can be equipped with peristaltic or volumetric dosing pumps which are driven by the same system. Revolutionary in-line 100% process control, with single component reject from the nest. Robot asynchronous movements, allowing single operation completion. Empty tub/tray transfer performed at robot base level without the use of conveyors. Use of a linear stopper feeding system, avoiding particle generation from vibratory bowls. De-nesting operation available for high-level quality control, with robot individual component handling. All the operating units (filling, IPC & stoppering) are located in a remote location from the product path. Further risk deduction is achieved by integrating the fill-finish process within gloveless barrier isolation systems. Easier access to filling and stoppering areas from both sides of the machine. Improved protection of the fill-finish process by an uninterrupted unidirectional airflow. Advanced ergonomics with air recirculation duct redesign. Reduced isolator shell width with positive impacts on space ergonomics. 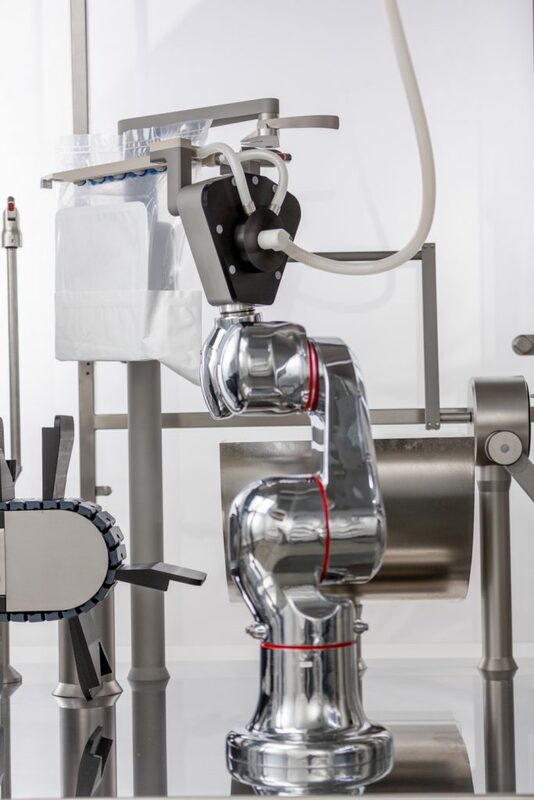 By embracing and adopting new robotic technologies throughout all production operations, from outer/inner bag opening to the stoppering station, INJECTA allows for a very smooth production process, drastically reducing human interventions and therefore cross-contamination risks. INJECTA can be further integrated with an in-line lyophilisation process, where an automated Loading/Unloading system handles products into and out of the Freeze Dryer. At the end of the lyophilisation process, the pressure applied by the Freeze Dryer shelves closes the vials. 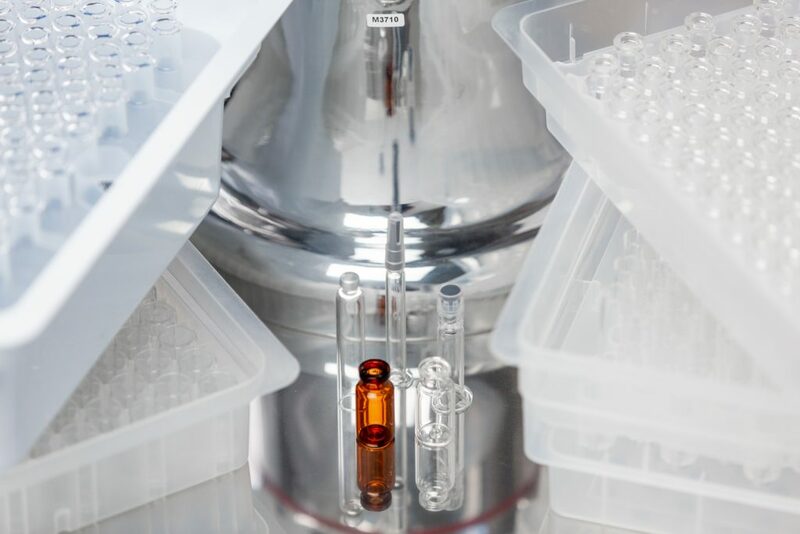 Then, stoppered vials move to capping operations, relying on conventional standard primary packing components (alu caps). INJECTA’s fully automated technologies fulfil Authority guidelines for data integrity and keep up with new industrial principles. In line with Industry 4.0 requirements for interconnected production data, INJECTA’s integrated automation platform allows for complete data accessibility and circulation, efficiency and ability to exchange big volumes of data. In short, considering that pharmaceutical companies need technology support for automated and interconnected manufacturing, we can say that INJECTA, by providing improved quality and flexibility in the production process, can fully achieve this reality. When effectively implemented, automation can increase efficiency, productivity and quality while reducing costs and time-to-market.